Yoga, which means “union” in the classical Indian language Sanskrit, is an ancient Indian science of exercise and healing that originated more than 5,000 years ago. This union is a holistic process – whether it be the union of the body, mind and soul, or the union of the individual consciousness with the divine. This union is believed to be achieved through asanas (postures), pranayama (breathing exercises), pratyahara and dharana (relaxation techniques) and dhyana (meditation). 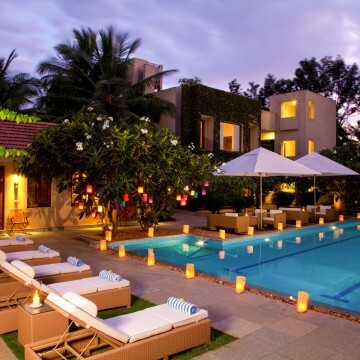 Shreyas Yoga Retreat, consistently rated as one of the world’s best yoga retreats, is situated on 25 acres of lush gardens and located 1 hour from Bangalore International Airport. Shreyas prides itself on teaching yoga in a traditional ashram style – daily yoga and meditation sessions, chanting classes, a strict vegetarian and no alcohol policy, and community service – but giving guests a luxurious environment and personalized attention. Come on this 3 day retreat to detoxify, nourish and recharge yourself through daily personalized yoga and meditation sessions, group chanting classes, rejuvenation massages, gourmet vegetarian cuisine and use of the beautiful facilities. If you feel so inclined, at the end of the retreat, Shreyas can provide you with a personalized road map to guide you down to a spiritual path of self-discovery.